The October issue of Vanity Fair magazine has a Scientology-related cover story about Tom Cruise that makes Paul Thomas Anderson's The Master look like light comedy. Let's see, what day is it? Jan. 31? Oh, then it must be time for everyone to fulminate over the Vanity Fair Hollywood Issue, specifically its lack of diversity among the featured cover stars. It's a seasonal ritual almost as inviolable as Groundhog Day, with equally severe implications of who made the cover (and where). To wit, a lot of white chicks. Cue six more weeks of winter! At least in the grocery checkout aisle, anyway. Photoshoot homages are a dime a dozen at this point, and it's hard to separate one starlet's Breakfast at Tiffany's tribute from any of the hundreds of others. That's why Lady Gaga's new cover shoot for Vanity Fair, in which she toasts My Fair Lady and Funny Girl, is so ideal: Unlike most celebrities, she can take iconic images, juxtapose them with her own persona, and make them mean something new. She's not just aping Barbra Streisand's pucker like Jennifer Aniston, she's relating a muse to herself, and that's impressive even in a bombastic Annie Leibovitz shoot like this one. It's what really makes her the new Madonna, not sheer popularity. Photos after the jump. If there's one thing we've all learned from Sheenpocalypse, it's that nothing good has ever come from watching Two and a Half Men. And who do we have to blame for keeping ratings high enough that Charlie Sheen became the highest paid actor on television before his descent into madness? 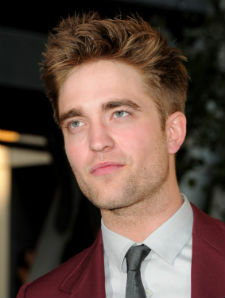 Robert Pattinson, that's who.